Basic kit for Office, Classrooms, & Meeting rooms. This complete Kit will accommodate up to 100 running feet of loop wire (or a room approximately 20 x 20 in size, allowing wire for connections). This should accommodate up to 30 people, and comfortably give amplified sound through the use of their t-coil hearing aids. Those with out t-coiled hearing aids, can use a receiver with headset or ear piece to enjoy amplified sound. A simple connection to the lapel microphone, or TV/Video gives the listener amplified sound. 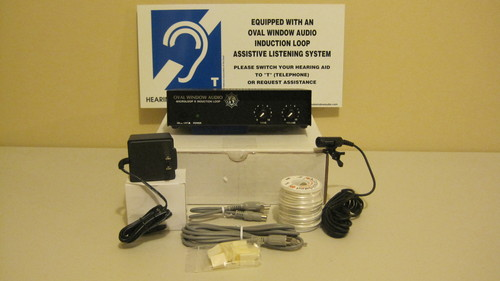 The Microloop II kit is complete with Amplifier (with 2 microphone inputs, 1 line input, & 1 line output) Power Adaptor, 1 Clip-On Omni Directional lapel microphone with 10 foot cord, 100 feet of Loop wire with mounting clips, and easy to follow installation instructions. 1 Amplifier, with 2 microphone inputs, 1 line input, & 1 line output.